The Republic of Montenegro, situated on the southern Adriatic coast of Eastern Europe was, for a long time, considered unsafe for tourists. Now it is deservedly being extolled as the new dream holiday destination. The charm of this country lies in its picturesque medieval towns and villages, river valleys, beaches, lakes, and mountains. 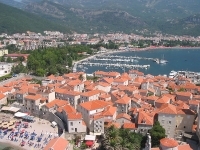 The most popular area for tourism is the narrow coastal section, which stretches from Igalo in the west to the Bojana river mouth in the east, indented by numerous fjords, and washed by the Adriatic Sea. Across the Dinarian Mountains is the central plain, where the capital, Podgorica, swelters through hot summers and the scenic Skadar Lake region offers a retreat. The north of Montenegro is dominated by mountains, where rivers have carved spectacular canyons through the forests. Winter in this region is particularly attractive, with the ski resorts of Zabljak and Kolasin. There are also two national parks in this area, which draw keen eco-tourists.